Now, first off for this week, we need to pick a winner for the Cutting Assignment. And great job to everyone on finishing that assignment, I am so excited to be quilting-a-long with you all!!! 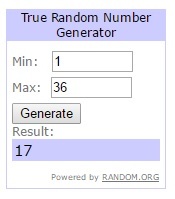 The cutting assignment winner who gets a Charm Pack and Mini Charm Pack of their choosing from Shabby Fabrics is . . .
Now you don't have to keep track of where these will be going in your block or anything, just be sure to use the same 4 little squares on each unit and you will be great. And now you are ready to start making your Flying Geese. To save time, I like to do each of these steps in assembly line fashion, however, the pictures will just show a Flying Geese units of one fabric. Now pin both sides of each square adjacent to that drawn line. Make sure to put them out far enough that your presser foot won't hit them as you sew on by :) Again, remember we are assembly line piecing these, so pin all of your units. We will be stitching a 1/4" seam along BOTH sides of the drawn line (the black lines represent your stitching lines :) but to save time and thread, we will chain stitch these. And you will notice, you should have an extra 2 matching print small squares for each unit. We will get to those in a bit. So to start, chain stitch the 1/4" seam on the left hand side of the drawn line first. I just chain stitched through the entire pile and it went so fast :) For those who are new to this, Chain stitching is where you don't clip the thread between each unit sewn, just keep feeding units through the machine until you have stitched your entire pile. Now, clip the threads between the squares. Then, go ahead and stitch the 1/4" seam on the right hand side (or other side) of the drawn line on all your units. You'll have some super long fabric snakes :) Clip the threads between the units and make a large pile ready for cutting. Press the seams up towards the 2 little print triangles. I find it easiest to press these from the front. And you are half way there!!! Now to use up those remaining small print squares. Now pin each piece far enough to leave room for the presser foot, then once again we are going to be stitching a 1/4" seam along BOTH sides of the drawn diagonal line. And once again, place your units on your cutting mat, and using your ruler aligned along the drawn line cut your unit in half . So now what started as 1 large squares, is 4 units. And that is where your 4 flying geese come from. Press your seams up to match the other seam. You can press from the front or the back, whichever your prefer. Lastly, trim off the little dog ear corners at either side and the top of your unit. Note, Just trim the dog ears, don't trim the tops to where the point is, you will need that 1/4" overlap for your seam allowance. And you are done!!! Perfectly precise flying geese blocks without throwing away any scraps and without sewing a single triangle. Fabulous!! 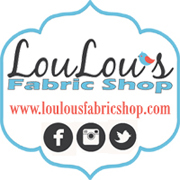 The Weekly Prize is sponsored by Lou Lou's Fabric Show and a huge thanks goes out to them for their support of the Summer Solstice Quilt-A-Long. This weeks prize is a Volume II Jelly Roll by Sweetwater for Moda. 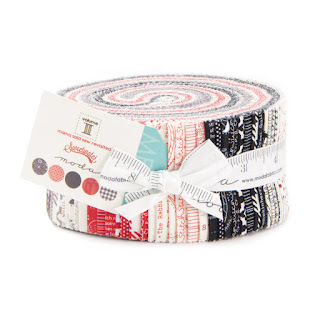 This is such a fantastic line and perfect for the QAL as all the prints are about sewing!! So fun!!! So let's get sewing!!! Yippee for getting all the cutting behind us and moving on to sewing!!! Oh, and if you have questions, don't hesitate to email me at happyquiltingmelissa@gmail.com. Have a Happy Quilting Day!! Deck the Halls for a Holiday Wishes Event!! !